Flashing back to 1989, I was a newly minted U.S. Navy sailor. I had graduated boot camp and was learning the job skills needed for my chosen career. I was attending what is called technical “A” school by Navy definition and what that means is I was required to sit in a classroom and learn about computers on base at San Diego, California. Much like other formal learning facilities the Navy allows your evenings and weekends free, provided you weren’t assigned a working party to clean something or stand a watch. There was a weekend in August and I had heard that there was this event being held called Comic Con at the convention center. With lack of anything else to do I decided to go check this out. You should realize that I have had just a passing interest in this medium up to this time frame. I had collected Cracked magazines in the past but nothing formally called a comic book. Sure I was aware of the heavy hitters … Superman, Spider-Man, Batman, Hulk … pretty much whatever main media had thrown at me so my knowledge of these characters was influenced by my viewing of the Super Friends cartoon, The Incredible Hulk TV show, and Batman TV show reruns. That was pretty much the extent of those characters, right? Wow, was I ever wrong and naïve into the world that I would soon, come to, appreciate and love. Unlike today’s standards where getting into the door of the San Diego Comic Con is not a small feat and requires months or years of pre-planning. Side note, if I now qualify as the media due to my blog and podcast I will gladly take any tickets that anyone wishes to offer for future comic conventions especially the king daddy San Diego show (wink, wink, nudge, nudge). So, back to my story, I take the trolley out to the convention center pay my admission fee for a day pass and I am in. I remember being a bit taken back by the sheer volume of vendors and fans. This was definitely more than what I was expecting. This wasn’t just a few vendors with a few boxes of comic books setup on a folding table with geeky fan boys with thick glasses slobbering through looking for some obscure back issue of Aquaman. This was … something bigger …. something kind of wonderful …. something AWESOME! Safe to say this event along with a movie I would catch a little later would hook me in a major way into a love for the comic medium. Yes, I jumped onboard to comics when I was 18 years old, feel free to call me a late bloomer. 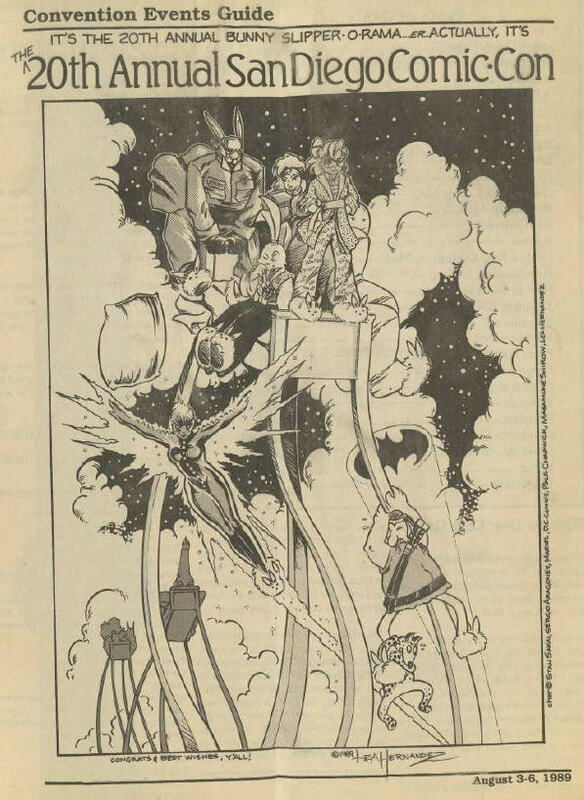 I honestly, don’t remember attending any panel discussions and I have taken the liberty to dig out the convention events guide that I have kept all these years and scanned it and made available in this blog entry. Click here (zippyshare link) to download the program in PDF version. No, it is not the program guide to the 20th Annual Bunny Slipper-O-Rama as stated. I did make two discoveries and purchases that would start my meager comic book collection. One was something that fell in line with my past connection to the satirical type book, similar to Cracked or Mad magazine that I had enjoyed. This was something a bit different. I knew of the Teenage Mutant Ninja Turtles but I found a book that would plot a teddy bear against them. His name was Boris. 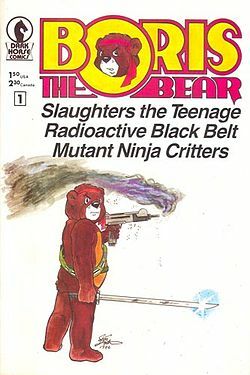 Boris the Bear on issue one was depicted as a teddy bear with an uzi and brandishing a sword but then further promises that he “slaughters” the Teenage Radioactive Black Belt Mutant Ninja Critters. Sold! I bought that bad boy and I believe also picked up issue 2 and 4 at the same time. Spoiler alert, later Boris would be revealed to be a robot teddy bear, how freaking awesome, is that? Good job Dark Horse comics, you got me hooked way back then. My next discovery which would help shape my ongoing love of the Batman. 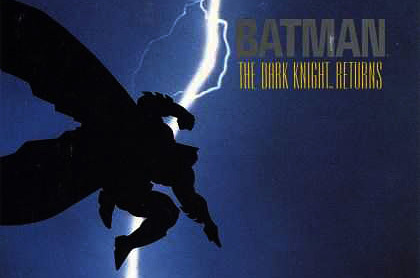 I discovered and purchased the trade paperback of Frank Miller’s The Dark Knight Returns. This was not the version of Batman I had seen from the TV shows and cartoons to date. This was something darker, something far less “campy”, and something really wonderful. The story line introduced a now aged Bruce Wayne that had retired from being Batman and was drawn back into his vigilante lifestyle to protect Gotham City. There was absolutely nothing I hated about this graphic novel and what you will read in future Dave’s Utility Belt blog entries is what has become the defining super hero of choice for a the majority of my coolest collectibles. That summer I would also see Tim Burton’s Batman film, which will be discussed on another super awesome episode of 80s Reboot Overdrive podcast. Posted on October 30, 2014 by The Southgates and filed under Uncategorized.